Rounding out the third wide-angle, black and white, architectural photo from Daisho-in, here’s a bonsho in fisheye. 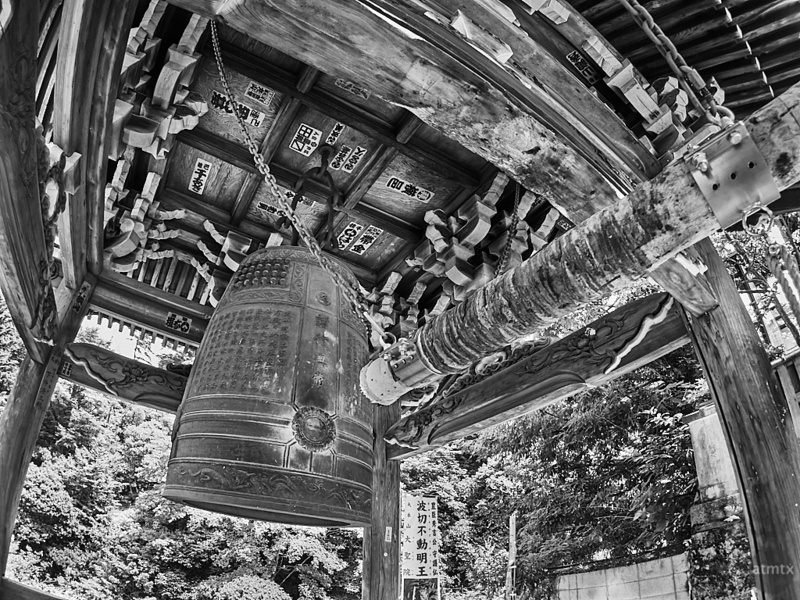 A bonsho is a large bell found in Buddhist temples throughout Japan. They are typically used to summon monks to prayer. This one appeared to be accessible to visitors and you can swing the large log to hit the bell, which makes a deep, resonating and satisfactory sound. I used my wide-angle lens in the last two pictures to add additional distortion. A fisheye lens, as used here, creates even more curvy distortion. The inexpensive and very small Olympus Fisheye Bodycap is a fun lens to use on occasion. Combined with the contrasty daytime black and white, this image as well as the last two have almost an etched look. Atypical photographs to be sure but I think it creates something interesting in the not too great midday light.